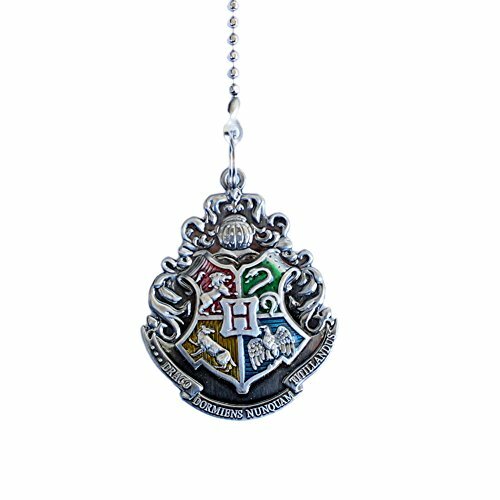 Add a little more extended length with our Harry Potter Hogwarts school crest pewter ceiling fan pulls. Features a 2 sided design with four color engraved crest. Made of durable pewter. Easily attaches to your existing chain. Measures approx. 2.25" H with a 7"L chain. Great for Harry Potter fans! Makes reaching fan & ceiling light pulls easy and convenient. Easily attaches to your existing chain. Crafted from durable pewter w/ a 2 sided design. Measures approx. 2.25" H with a 7"L chain.